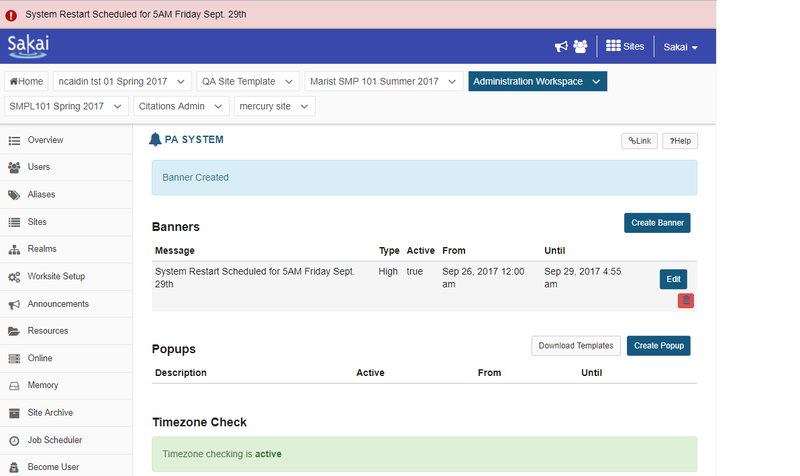 Sakai Community DocumentationSakai 12 Administrator Guide (English) PA SystemHow do I create a banner system message? Message: This is the text that will display in the banner across the top of the screen. Type: Choose the type of priority for the message. High priority messages display in red and cannot be hidden or dismissed by users. Medium priority message display in green and can be hidden by users. Low priority message display in blue and can be dismissed by users. Active: Check this box to indicate that the banner message is active. This may be used as an alternative to setting start and end dates if you plan to enable/disable the message manually. 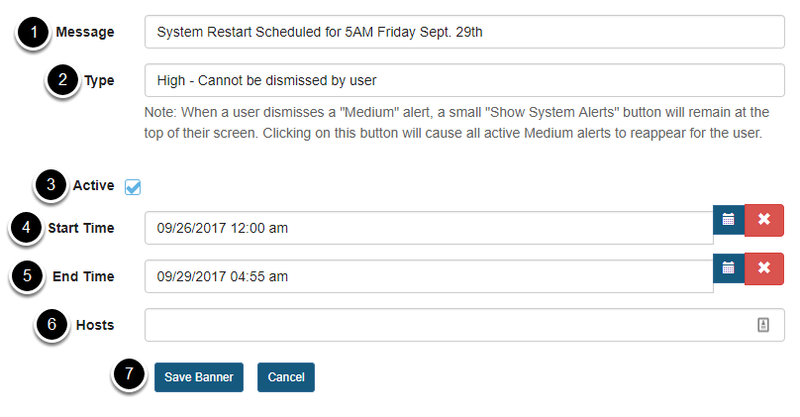 Start Time: This is the date and time when the banner message becomes visible to users. End Time: This is the date and time when the banner message is not longer displayed to users. Hosts: If you would like to limit the banner message to specific servers, you may enter the host information here. When you have entered all of the message information, click Save Banner to save your changes. When active, the banner message will display at the top of the screen, as shown in the image above. Prev: What is the PA System? Next: How do I edit a banner system message?